Commercial concrete flooring in Southwestern Ontario is becoming increasingly popular. In the London, Kitchener, Hamilton, and Brantford regions we have largely been using 100% solid epoxy floor coatings because they are durable, resilient, and attractive. In Commercial settings such as warehouses, manufacturing plants, art galleries, and retail outlets, concrete flooring has become the practical choice. Some of the more popular commercial concrete flooring applications now include seamless vinyl colour chips or quartz granules, multi coloured stains, metallic pigments, and theme matching colour combinations. With an endless range of color-styles, texture, size and blending options, commercial flooring systems are becoming more customized. In commercial settings image is important. If you are uncertain about the look you are trying to achieve, we can recommend some options and products that can enhance your image and protect your facility’s architectural value. Floor colors and designs can draw attention and influence traffic flow as well as reflect light and brighten areas. Epoxy floor coatings work well in commercial spaces such as retail, galleries, and restaurants. 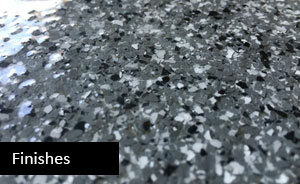 The colored epoxy decorative coatings bring texture and depth while illustrating the artistic viability of the floor. 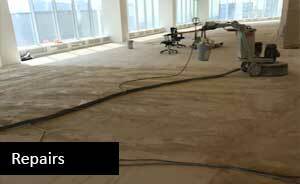 Our commercial flooring solutions include decorative resinous flooring and polished concrete flooring. Commercial concrete floors have become increasingly more durable with the ability to resist heavy foot and equipment traffic as well as chemical stains. With life spans that stretch beyond 30 years, concrete flooring systems are far more economical than other types of flooring and they require little maintenance. 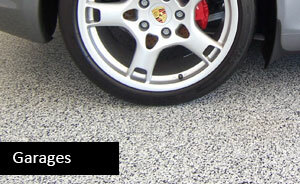 They can also be made slip resistant so that they are safer to walk on. The safety and durability factors alone are why these types of floors are used in retail stores, hospitals, warehouses, auto dealerships, airports, and fire departments. As concrete flooring specialists, we can help assess your needs and recommend the best commercial flooring system that is right for you. For a FREE, no obligation quote call us, or send us a quick email.